Britain's Foreign Secretary Boris Johnson, arrives at number 10 Downing Street for a cabinet meeting in London. 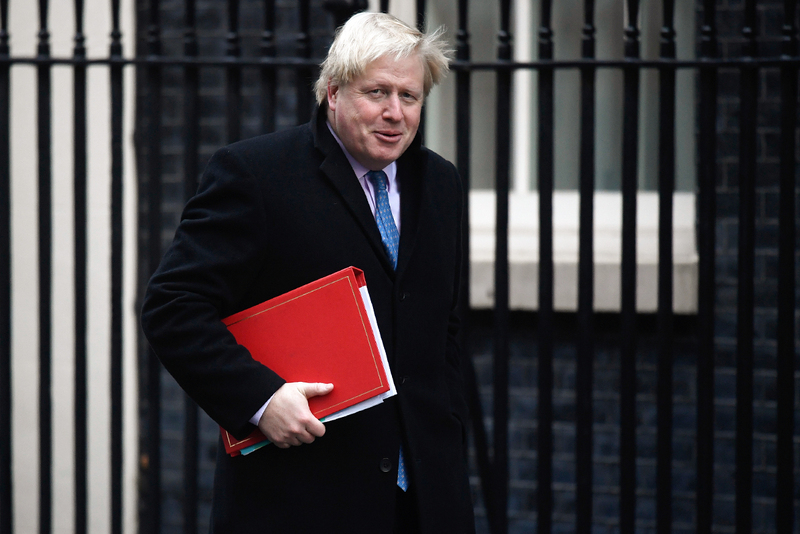 Boris Johnson's plans to meet Russian foreign minister Sergey Lavrov - the first senior British diplomat to visit Russia in nearly five years - comes hard on the heels of a declaration by the Commons' Foreign Affairs Committee that it is ‘short-sighted’ not to engage with Russia. Will Moscow see it as a breaking point? View it as a sign that relations between the two countries are at rock bottom? Or will a 'reasonable' approach that seeks to find a working relationship prevail? Johnson, the eccentric maverick that heads the Foreign & Commonwealth Office (FCO), is likely to stick closely to the British government's script without indulging either in his trademark bellicose rhetoric (like calling for protests outside the Russian embassy in London) or in a Trump-style appraisal of the Russian leadership. The meeting scheduled for later in March, is likely to see Johnson 'do a May'. In a speech in Philadelphia in January 2017, Prime Minister Theresa May spelled it out, loud and clear: “When it comes to Russia as so often it is wise to turn to the example of President Reagan who – during his negotiations with his opposite number Mikhail Gorbachev – used to abide by the adage 'trust but verify'. With President Putin, my advice is to engage but beware'." However, surely it represents a move to different mood music and terms of engagement. After all, symbolic gestures matter in diplomacy. Yet, given the inertia of the accumulated animosity in dealing with London, Moscow is not likely to qualify Johnson’s brief stopover as a gesture of goodwill. It is likely to view it as a tacit admission that by unilaterally rupturing the relationship Britain has reaped few discernible dividends. The report is a remarkable and unique document. It directly expresses regret that “the practical effect of economic sanctions on Russian decision-making is doubtful”, and apprehension that Trump could drive a new Western policy of "containment". Strangely enough, Moscow has so far avoided presenting and pressing a list of allegations against London for violations of international law. However, judging by the gradual evolution of substance and style of Putin-Lavrov’s diplomatic modus operandi, it could come to this. In March 1999, Britain's Royal Air Force took part when NATO launched a bombing campaign against a European country. The air strikes over Serbia lasted 78 days. NATO’s unprovoked use of force, aimed at carving out a new Muslim nation state in Europe, killed 1,700 civilians - 400 of them children. In March 2003, on a false pretext, British Prime Minister Tony Blair and his government assisted (or did they actually ‘lead from behind’?) the U.S. invasion of Iraq. By April 2015, this violation of international law had directly resulted in the deaths of around 165,000 civilians. Last year Blair's decision to go to war was roundly criticised following the publication of the findings of a public enquiry, the Chilcot Report, which contained a damning condemnation of Britain's role in the war. Gross foreign policy miscalculations during the U.S. occupation of Iraq triggered the emergence of ISIS. President Trump has repeatedly placed the blame for the creation of this monster on the Obama administration. Yet, it does not diminish the contribution of George W. Bush and Tony Blair to boosting the threat of terrorism. In 2011, once again the Royal Air Force - and reportedly SAS operatives - bombed and subverted the legitimate (irrespective of its moral credentials) regime in Libya. In doing so, the UK violated international law, in particular a UN Security Council resolution, which explicitly allowed for the introduction of a ‘no fly zone’ but did not provide a mandate for regime change. Two centuries ago, Russian emperor Paul I, furious at perfidious British behaviour, joined Napoleon’s Continental Blockade, persuading Sweden, Denmark and Prussia to follow suit, introducing an embargo on all British ships entering Russian ports - and eventually dispatching Cossack regiments to march on Britain's colonies in India. The emperor also placed the Knights Hospitaller in Malta (the fortress that controls access to Mediterranean maritime trade lanes) under his patronage and was named the Grand Master of this chivalric order. One hypothesis claims that these 'unfriendly' actions earned Paul I the wrath of the British ruling class. With enough pro-English agents of influence in Russia and a strong motive, they conspired to ensure the reign of Catherine II’s son was as brief as possible. In March 1801, Paul I was brutally assassinated. Oswald Theodore Rayner, a British MI6 agent in Russia during World War I formed a close relationship with Felix Yusupov and was allegedly involved in the murder plot against Grigori Rasputin. According to British author Andrew Cook, Rayner delivered the final shot that finished off the influential monk who was advocating – much to British anxiety – forging a separate peace with Germany. Whether true or not, it does not contradict evidence that ambassador George Buchanan was in close contact with members of the Duma favoring an alliance with the British Empire. Cook quotes a memo written January 17, 1917 by a British intelligence official about the murder: “Although things have not proceeded entirely to plan, our objective has clearly been achieved.” The memo is open to different interpretations, but given the apparent motive for murder, it is hard to dismiss Cook’s assertion. Recently, another conspiracy theory has emerged that merits closer study: The mysterious March 2013 death of Russian oligarch Boris Berezovsky in Berkshire, a county to the west of London. Berezovsky's former long-time head of security Sergei Sokolov claims Western intelligence agents killed his boss. Motive? Berezovsky intended to disclose to Putin evidence that key oligarchs in Russia were plotting to topple him. It happened after Berezovsky sent a letter expressing ‘repentance’ to the Kremlin and planned to return home from self-imposed exile. Naturally, all these allegations could be dismissed for lack of direct evidence. However, the new generation of Russia's political class that has matured in the last 20 years (since the NATO bombing of Serbia) deeply distrusts the West. This is deplorable since perceptions, either fact-based or illusory, will shape the attitude of decision-makers in Moscow in the midterm. Over the course of a number of fascinating interviews with Sir Andrew Wood when he was UK ambassador to Moscow, the senior career diplomat would sometimes mildly complain that many of his Russian peers could not grasp the expediency of the typically British mindset: “Be reasonable", and would obstinately abide by their habitually emotional guidelines. Following Sir Andrew Wood’s advice, it would be wiser to keep saying to each other and to ourselves: "Be reasonable”.